EPCOT was the second Walt Disney World theme park opening exactly eleven years after Magic Kingdom on October 1, 1982. 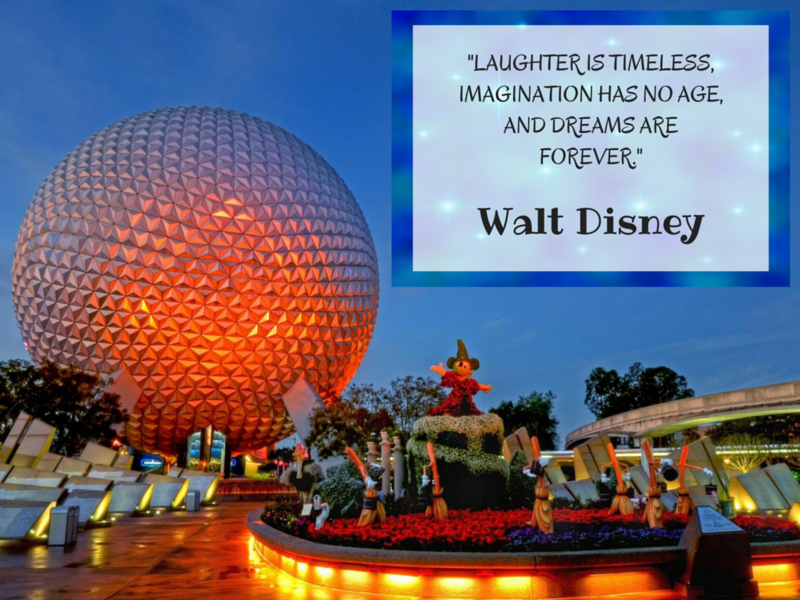 It is more than doubled the size of Magic Kingdom and is approximately 300 acres. Most people don’t know that EPCOT stands for experimental prototype community of tomorrow the city envisioned by Walt Disney himself. You can still see the original model of EPCOT when writing the Tomorrowland transit Authority previously known as the People Mover in Tomorrowland at Magic Kingdom. Two entrances to Epcot. The main entrance is of course the front of the park when you see spaceship Earth otherwise affectionately referred to as the big golf ball. When you go to the parking gates if you have a handicap placard for your car you follow the blue line and will be directed to special handicap parking which is closer parking. D regular main parking area you will park and then be directed to the tram which takes you to the entrance of the park. The second entrance is between England and France and referred to as the international gateway. For guests staying at the EPCOT resorts which are the Disney dolphin, the Swan, the Boardwalk, the Yacht club, and the Beach club, they can either walk to the International Gateway entrance to EPCOT or take the canal boat system or of course ride their mobility scooter if they have one they have rented for their use during their vacation. If you were staying at one of the other Walt Disney Resorts that are not one of the EPCOT resorts, you will either use the monorail or the buses to get to the park. The monorail it Drops off visitors right at the front entrance to Epcot and the buses are just a little further away. Just like all Disney theme parks, once you are at the actual park entrance, those people carrying bags, backpacks, and purses have to go through the security checkpoint. After you pass through security you then get to the actual entrance gates where you now can use your Magic band for entry or a ticket. After passing through the entrance gates you have the perfect Photo spot for taking the picture was spaceship Earth a.k.a. the big golf ball, right behind you. It is also the first attraction you come upon as there is a ride inside spaceship Earth. You get on moving carriages and right up and around to the top of the inside of the spear and then come back down anyone can do this ride. Once you exit the ride there is lots more to do and say with different video games interactive games virtual games and a way to even send an email to yourself other picture that was created when you were on the ride at no charge. Something that is fun to do and free this is stop by Club cool by Coca-Cola where you can try different flavors of soda from different countries. Adjacent to a club cool is also the character spot where you can go in and take pictures and great settings associated with each of the different famous Disney characters. Moving past future world you’re on to the world showcase. There you can visit 11 different pavilions that represent 11 different countries. These civilians are primarily staffed by citizens of the respective countries. So you truly do get a flavor of each of the individual countries. The countries are: Mexico, Norway, China, Germany, Italy, United States, Japan, Morocco, France, United Kingdom andCanada. Each country has its own unique dining experience typically offering both lock up fast service our reservation restaurant service. For and since Japan has both a sit down sushi restaurant and a walk up fast food sushi restaurant as well as a hibachi restaurant where they cook a meal in front of you on the hot grill. There are two annual events at Epcot that are fun for the whole family. In the spring they have the home and Garden show and in the fall they have the food and wine festival. Also there is always the fantastic Christmas celebration with the candlelight processional. School and church choirs from around the US are invited to come sing and a guest celebrity narrates the story of Jesus Christ birth. At EPCOT you have two choices which are to either rent inside the themepark or from an outside Orlando scooter rental company. If you choose to rent from Disney World you must rent the scooter from inside each of the individual theme parks. Since they’re provided on a first-come first-served basis and you may not reserve them in advance, it is a good idea to consider reserving your own Orlando scooter rental. Telephone reservation assistance from 6 am to 11 pm, 365 days a year. Mobility: SV’s electric wheelchairs (scooters) are self-propelled and last all day so you won’t need to rely on others to assist you. Epcot wheelchair weight restrictions: Epcot’s wheelchairs have weight restrictions (about 350 pounds). Our electric scooters can facilitate more weight. Wheelchair availability: Epcot’s wheelchairs are available on a first-come, first serve basis which means that they can can sell out (no availability). Book an electric scooter for Epcot with Scooter Vacations and we guarantee availability. Park Hopping: If you plan on leaving Epcot and visiting other parks or attractions in Orlando, you’ll need to return your wheelchair at Epcot and rent a new wheelchair at each park you visit. Rent from Scooter Vacations and your scooter stays with you all day, whether you stay at Epcot or head to other Orlando attractions! What is the Cost for Wheelchair Rentals at EPCOT? In EPCOT, you have two choices for renting electric wheelchairs. First, you can rent from an outside company. To rent a mobility scooter from Scooter Vacations, we deliver to your hotel, resort, timeshare, etc. Our scooters range in price from $25-$40 a day depending on the model. We offer multi-day rental discounts for longer rentals and have many special partner discounts and special coupon offers on our website. All Scooter Vacation scooter rental models fit on EPCOT buses boats and monorail. We also have portable models that will fit in a car or taxi trunk and we’ll handle up to up to a 450 Lbs. capacity for a 12 the 15 hour theme park day. They are $35 per day and luxury on-property only models (meaning you cannot put them in a car to transport them) are $35-$40 a day. Nest, you can rent directly in the park (EPCOT) when you arrive. Most recent prices at EPCOT for renting a scooter inside a theme park is $50 dollars plus a $20 dollar a day refundable deposit. If you would like to rent a mobility scooter for the downtown Disney area the daily rate is $50 but then the refundable deposit is $100. To rent a mobility scooter (ECV) from EPCOT inside the theme park, the guest must be 18 years of age to operate it and you may not have multiple people sitting on the scooter. The maximum weight capacity is 450 pounds. Wheel chairs EPCOT are $12 dollars a day inside the theme park and if you were there for multiple days you can make arrangements for a $10 a day price. If you’re staying at a Disney Hotel they provide them complementary with a $315 refundable deposit but they do have limited availability, Guest must be 18 years of age, and the maximum weight is 350 pounds on the wheelchairs. Also wheelchairs may not be reserved in advance. Scooter Vacations offers rental mobility scooters for use in EPCOT, Disney and throughout Orlando theme parks.